The world of Krynn is caught in the grips of a terrible war between the minions of Takhisis, Queen of Darkness, and the followers of Paladine and the gods of good. Dragons, both foul and fair, clash in the skies, and a small band of friends, who would one day be known as the Heroes of the Lance, strive for freedom and honor. 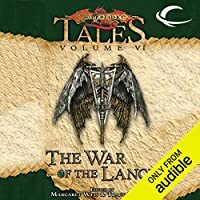 The story of this mighty conflict was revealed in the internationally acclaimed DRAGONLANCE chronicles Trilogy, and now many of the most famous scribes of the series return to tell other tales of Krynn's War Years.